The season of restaurant weeks is here! How cruel of the Chambers of Commerce (and other organizations) around Orange County to thrust the tempting siren songs of reduced-price menus upon us so soon after new year's resolutions are made to be healthier. They started as early as the second week of January with Irvine's run but what's starting tomorrow is Newport Beach's Restaurant Week. To make it even better, the vast selection for Dine Newport Beach is available for longer than the customary one week. Face the $10/$15/$20/$25 lunches and/or $20/$30/$40/$50 dinners for two whole weeks from January 19 to February 1 this year and decide on where to visit from a list of more than 60 participating restaurants. We took a gander at all of the menus that were posted up about the celebration and spotted quite an impressive number of steals. One of those that guarantee a bigger bang for your buck during these following two weeks is Great Maple Libations and Seasonal Plates which we were invited to visit and preview. 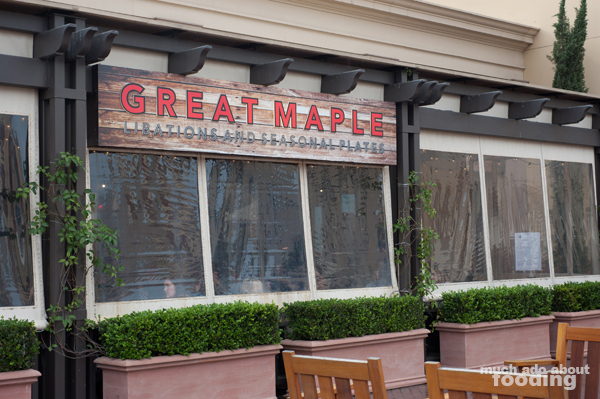 Located at Fashion Island in Newport Beach, Great Maple Libations and Seasonal Plates is situated where the previous Rustica restaurant sat outside of Nordstrom. 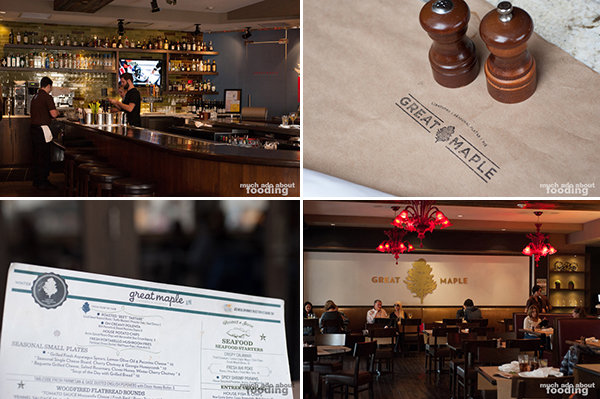 The owners had owned Rustica but shifted the focus at Great Maple to be quite different. Upscale ingredients and a fine attention to the dining experience are still implemented but in a more casual atmosphere befitting of the average Fashion Island customer. Some remnants of the previous restaurant remain in the decor however; I spotted Italian glass chandeliers in the main dining room that felt slightly out of place. Other than that and small details scattered throughout, the change to wood, patio furniture, and brighter colors has enabled Great Maple to seem like an entirely different concept. We had not been in until this visit but had always seen it busy and buzzing. Our experience that day was meant for the Newport Beach Restaurant Week 2015 menu but at the urge of our waiter to partake in the libations program of which they are proud, we went for two orders. The Midnight Pineapple ($12 - Hendrick's gin, caramelized pineapple, fresh lime, cucumber, and a splash of soda on the rocks) arrived in a squat, delicate glass and was brimming with the froth on top. Extremely refreshing with the strong taste of cucumber and herbaceous from the gin, this cocktail was certainly for a particular palate. As a lover of gin myself, I appreciated the juniper I could taste pulled through and balanced from the cucumber but if you are not accustomed to the woodsy characteristics of gin, you might not want to opt for this one. 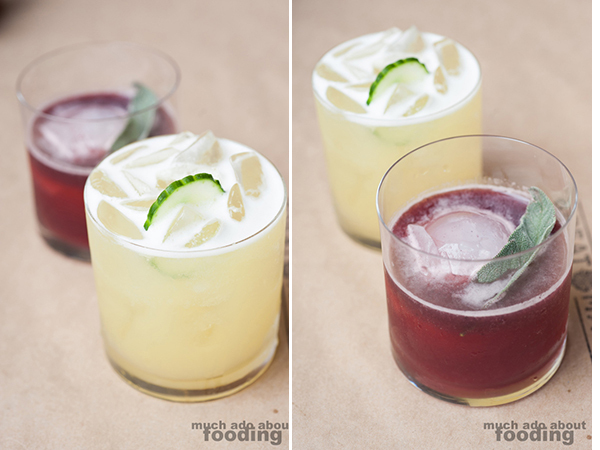 Instead, consider the Johnny's Kentucky Spirit ($13 - Woodford Reserve Kentucky Bourbon, house-smoked fresh blackberries, fresh sage, French sugar, and bitters with an ice block) which is strong and comes with a beautiful hue that mimics the depth of its taste. I was particularly fond of the ice block which was spherical rather than a cube, leading to constant spinning with each sip - an amusing touch to the drink. The blackberries gave just enough sweetness to combat any bite bourbon may have on someone. It was an excellent meal so far. 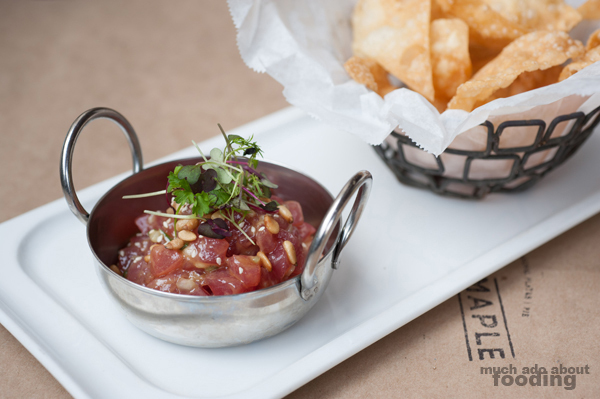 Great Maple's participation in Newport Beach Restaurant Week is for dinner only and priced at $30 per person. Each diner will get a choice of starter, entree, and dessert. I will, however, note the regular retail price next to each description below so you can see where the biggest savings can be achieved when you decide to visit Great Maple in the next few days (do it!). To begin, the options are their Crispy Calamari ($12 - fried calamari, lemon caper mayo, chile flakes, and fresh mixed olives), Fresh Ahi Poke ($16 - ponzu, pine nuts, and fried wontons), or Baguette Grilled Cheese ($8 - salted rosemary, clover honey, and winter cherry chutney). Please note that the starters for restaurant week are actually slightly smaller than the normal portion size, according to our waiter. Even with that warning, we found that the appetizers we chose were still quite bountiful. We went for the calamari and the poke, both excellent choices that really shone on their own. 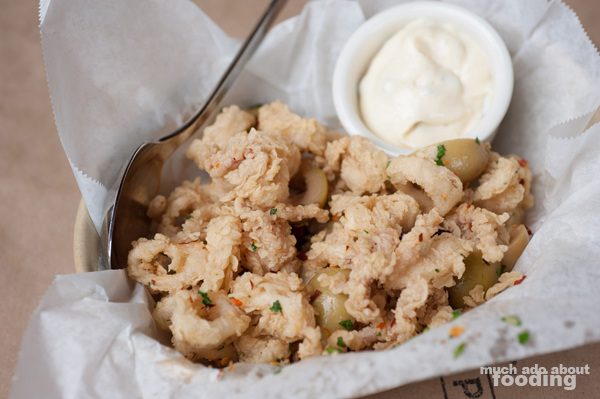 The calamari's batter was reminiscent of a fried chicken, and when mixed in with the salty zing of mixed olives, the calamari rings came to life in a new way. It never tasted at any point like an unhealthy starter due to frying. I suppose that's one way to do it! As for the poke, it was an interesting take on the Hawaiian treat as there was heavy usage of ponzu over the typical shoyu and sesame oil combination. This led to a brighter flavor with more citrus notes on the tongue, and using pine nuts helped keep the texture from slipping into too slick a status. Wonton chips? An excellent way to turn this into a do-it-yourself tuna tartare game. Onto the entrees! You would, again, have a choice between three options for the Newport Beach Restaurant Week 2015 menu. Choose from their Fresh Scottish Salmon ($25 - soft sauteed Babe Farms squash, cherry tomato, fresh eggplant, thyme, and feather light cream sorrel sauce), Organic Free Range Chicken ($22 - lemon and thyme, root vegetables, and smashed potatoes), or Montreal Spiced Grass Fed Beef Burger ($14.95 - fresh bakery bun, lettuce, tomato, aioli, and served with pommes frites). The decision was for the salmon and the burger just to understand the range of variety. When the salmon arrived, our heads turned at how beautiful the cut was in quality and in preparation. Laid flat across the sauteed vegetables, the blushing fish exuded a certain pride about it from its well-dispersed seasoning across the top to its crisped edges and fat height. Not only did it look appealing, it also followed through with taste. Rich and flavorful, the fish flaked away with each nudge from the fork and had the perfect amount of seasoning. 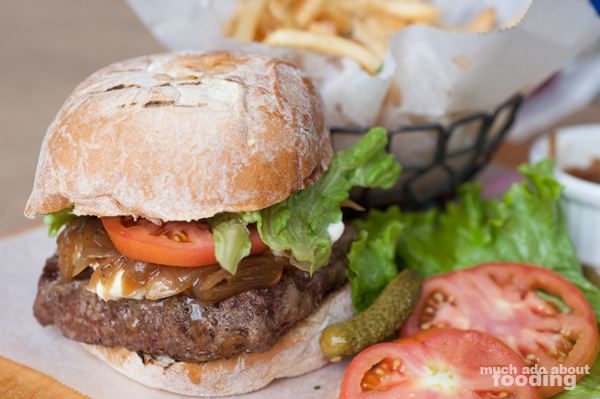 As for the burger, I modified it with the add-ons so that the meal morphed into a lamb (+$3) burger with a hefty slab of goat cheese (+$1) and side of caramelized onions ($1) and substitution of fries to Parmesan Dusted Truffle Frites (+$1.95). The "construction project" arrived on a wooden paddle for my own arrangement, vegetables on one side and the bun with patty and cheese on the other. We actually found the goat cheese to be overwhelming against the medium rare lamb patty (doneness chosen by diner) and the thick patty extremely juicy so that it nearly soaked the bottom bun. The flavor of the lamb was good though and the inclusion of gerkins on the board pleased us both. Caramelized onions were probably not necessary as they could get lost under the tomato and lettuce. The fries were excellent though, as we found out, not good reheated. Making them truffley though? I suppose that's a standard these days. So what are the options for the third course of Newport Beach Restaurant Week? 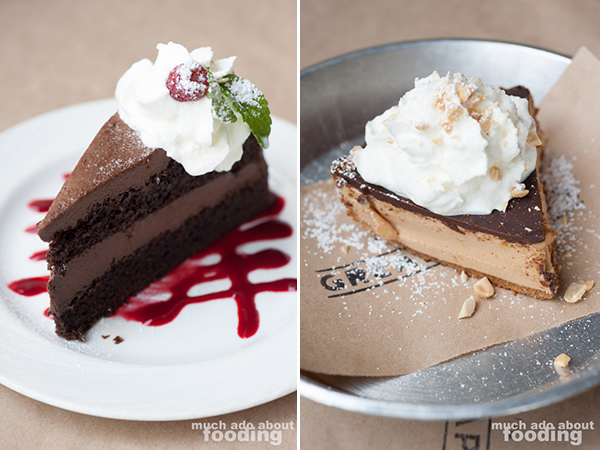 You can either go for their Seasonal Pie of the Day or the Chocolate Truffle Cake. That particular day, the seasonal pie was a Chocolate Praline Creme which looked very much like a peanut butter bar but tasted vastly different. This pie option will continue to change every day even during the Restaurant Week so make sure to check the Pie of the Day board when you go in! They were both light enough to allow our full stomachs more bites; we were surprised at the airiness of the chocolate cake and how much we were able to polish off of it. All in all, these were well-matched endings to the prix-fixe meals! As aforementioned, this particular menu runs at $30 per person prior to tax and gratuity and looks like a good deal unless for some reason, you chose the least expensive of all options every time. 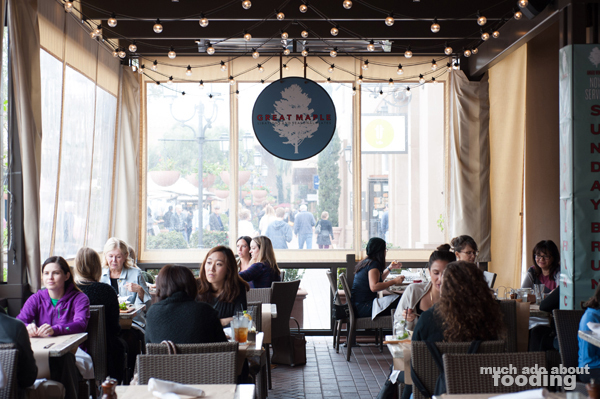 Considering that the delectable salmon runs at $25 normally, you will be getting value if you dine at Great Maple for Newport Beach Restaurant Week. The full list of restaurants participating can be found here; a few that we have already spotted that you might want on your radar are Roy's for value, Five Crowns for quality of food, and Provenance for sheer availability of options. Of course, we haven't explored every single menu but that can get you started. 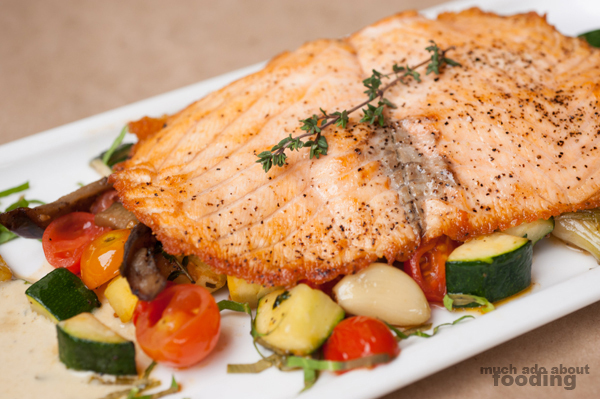 Let us know where you decide to Dine Newport Beach!